Great on the trail endorsement! See it on YouTube. Mescal-Devils Bridge and Mescal-Deadman Trails just added. We now have the trails with vortex sites marked clearly in the download screen. Easy to see which trails lead you to the sites. Android changes soon. Distance : 2.4 Miles, Approx 3 hours. This trail on the east wall of Oak Creek Canyon was once used to walk horses down to visit Oak Creek after the 4 to 5 hour wagon ride from Flagstaff. The wagons were left on top. It boasts sheer white cliff views. You can explore the forested bluff once on top, along with more exceptional views of the valley below. 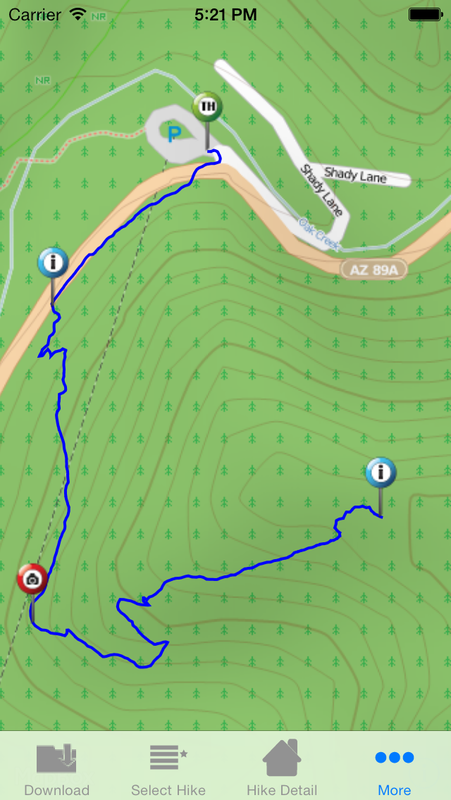 Trail has a 900 ft. elevation change. Shares trailhead area with West Fork Trail.